Bored of the same old entertainment on TV? Bored of TV Shows and the daily grind? 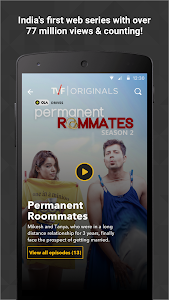 Download TVFPlay. It's Not On TV. It's On TVFPlay. India's leading Women Centric channel for entertainment that celebrates relatable, Real, funny & interesting stories about Women, which probably has never been told. Because everything about girls is Not From Venus! A New Age Comedy Channel for the Indian millennial - edgy, irreverent, funny videos and web-series. Packed with humour that men of all ages will enjoy, after all, The Screen Patti ke to Bande Hain Hum Chill. 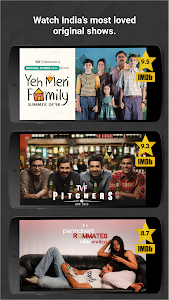 Starring - Gopal Datt, Rasika Duggal, Mukti Mohan, Sameer Saxena, Anandeshwar Dwivedi, Nidhi Bisht, Biswapati Sarkar, Amit Golani, Deepak Mishra, Anant Singh, Gajraj Rao, Akanksha Thakur, Shivankit Parihar, Vaibhav Raj Gupta, Harman Wadala, Badri Chavan, Rudraksh Thakur, Lianne Texeira, Ronjini Chakraborty, Prajakta Kohli, Niyanta Chopra, Raghav Kakker, Shruti Madan, Bani J, Harsh Beniwal, Namya Saxena, Priyanka Nath, Srishti Srivastava, Jasmeet Singh Bhatia, Vipul Goyal, Shreya Singh, Ahsaas Channa, Tina Singh, & many more! 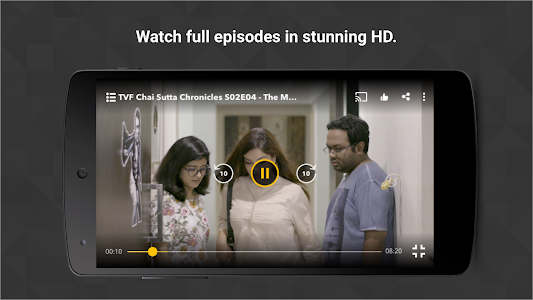 We’re excited to bring you our best TVFPlay app yet. • Introducing Play Feed – All of our latest releases and trending videos are now in one place. Start scrolling and preview any video by tapping on its thumbnail. • Go to My Feed to see the latest videos from channels you follow. • Find your Continue Watching videos in the Saved tab. Plus, Tripling Season 2 is coming soon! Watch the trailer today. 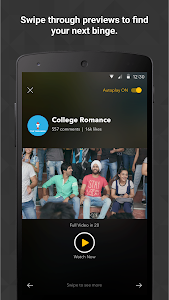 Similar to "TVFPlay - Play India's Best Original Videos"